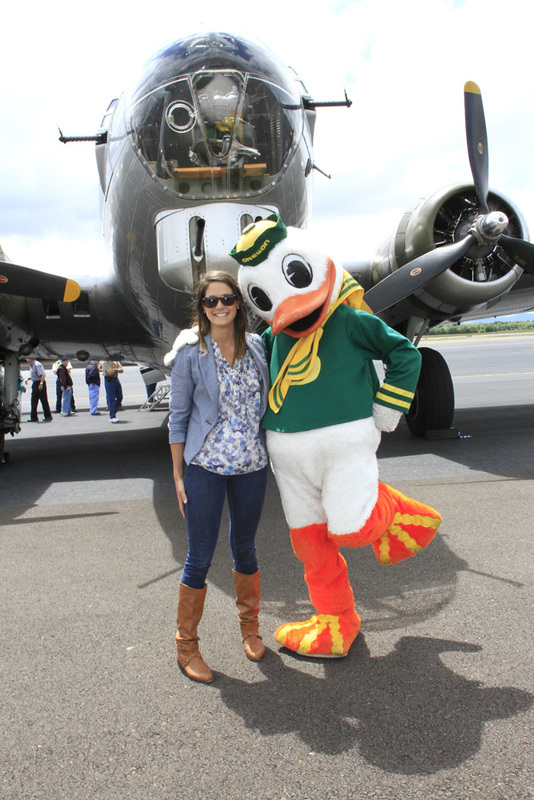 See the B-17 Aluminum Overcast at the Eugene Airport May 17-19. Read all about this rare visit here. This is part one of a two part series. 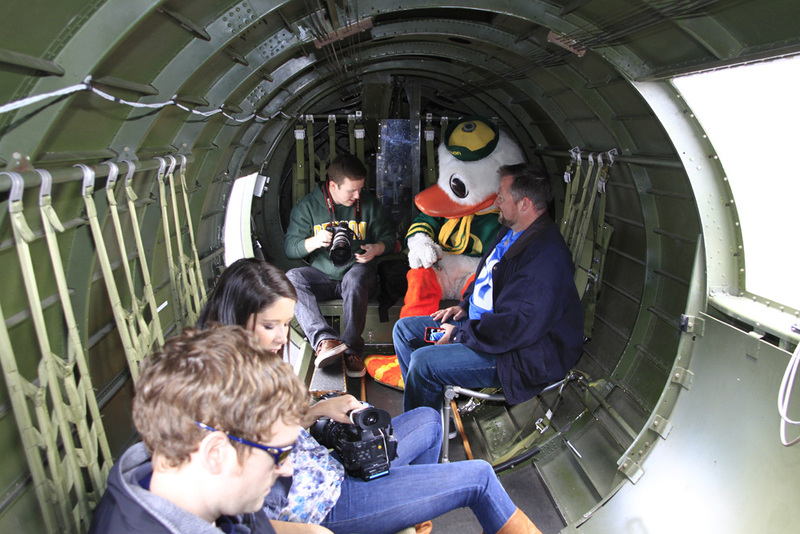 See a photo gallery of this "Ducky" flight here. 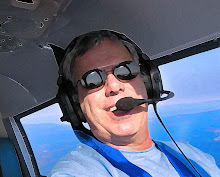 I have been growing increasingly amazed recently by all the great things that EAA does for the aviation family, and as a fairly new member, I consider my membership in this association as valuable as my long-time membership in AOPA. Up on Capitol Hill, AOPA keeps the pressure on Congress and the FAA as they lobby in our best interests. But when it comes to grass roots promotion of GA and keeping the spirit of aviation alive...EAA has set the enthusiasm bar quite high. The classy professionalism of EAA was on full display at the Eugene Airport today as the association brought their immaculate B-17 bomber Aluminum Overcast to the Willamette Valley for a stop on their 2013 Experience History tour. It was apparent to this writer that their devotion to keeping vintage airplanes and history alive while simultaneously exciting the public about airplanes is a thing of beauty to behold. Call him Puddles, or @TheOregonDuck, but at any University of Oregon sports event, this loveable, playful and feisty mascot wins the day every time he shows his beak. As I was coordinating the media to ride along on Aluminum Overcast, one of my chapter's members, Wally Anderson of Synergy Air, said he could get "The Duck"...if EAA could work out the details. When Puddles arrived on the ramp and began clowning around, EAA's tour crew kicked it into gear to give this beloved creature his first-ever airplane ride. 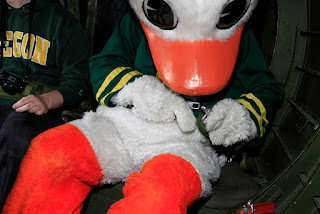 Once we determined he could fit in the door and get out of the airplane in case of emergency – and that the seat belt would fit – the engines were started and this Duck was soon witnessing the magic of FLYING. If you follow University of Oregon sports, you know the rivalry with the Beavers of nearby Oregon State University is legendary. 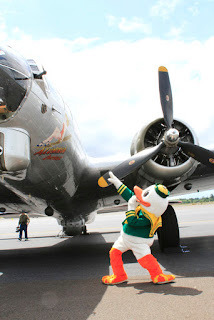 And as Aluminum Overcast headed north from KEUG in the general direction of Corvallis, home of OSU, Puddles was seen eyeing the machine guns on board. Yes, he takes his Beaver hunting seriously, and all on the flight, especially B-17 veteran Andy Andrews - who is "Beavers" all the way - were glad the bullets on board were blanks. Word spread quickly through the estimated 200 people on the ramp when we heard over the radio that "The Duck" was at the airport gate. And from the moment he stepped inside the airport, you could feel the positive energy elevate. Smiles erupted everywhere, because it is impossible to be bummed when this big white, green and yellow goofball is nearby. And he was spectacular too...clowning around, posing with everyone who wanted photos, and acting like the most rambunctious member of the Anatidae family of waterfowl. Kids love him, people flock to him, and any event he graces enjoys an increased happy factor. We were lucky to enjoy a few fun moments with this wildly popular mascot. With help from EAA's Crew Chief, Puddles was soon strapped in and ready to fly. I was seated just a few inches in front of him, and could see he was quite excited to finally take to the air. When asked if this was indeed his first flight, he left out a resounding QUACK...which was translated by his handler seated next to him as a yes. 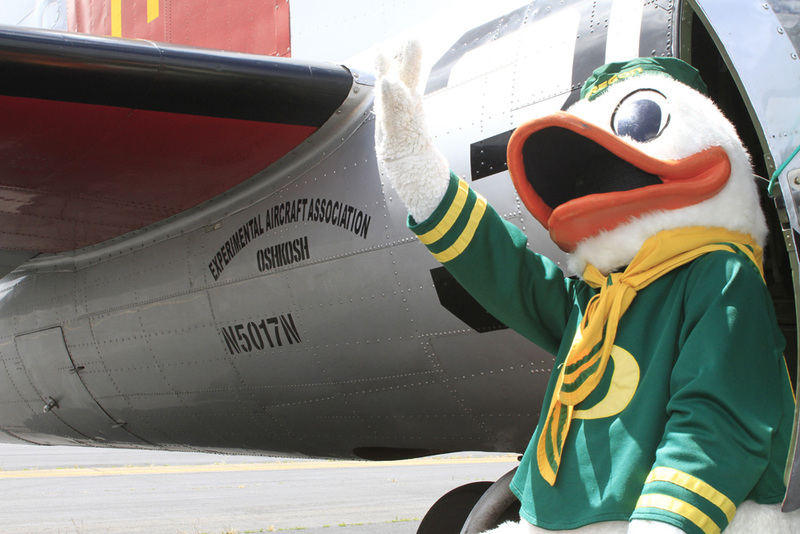 We were seated as far aft as you can get in Aluminum Overcast, and when the tail lifted for takeoff, "The Duck" grew increasingly giddy. Making wild flapping movements with his wings, his excitement escalated when we were allowed to move about the ship. He cooperated with the planeload of media who shoved various cameras in his face, and watching him move forward to the Radio Room was a hoot. Let's just say that Boeing did not design Flying Fortresses to accommodate a six-foot-tall by three-foot-wide...Duck. The way this flight came together validates my belief that we aviators are one very special group. When you walk the Airventure grounds during show week, you feel the camaraderie that is present, and all around you, people from EAA go out of their way to make sure you know they are your pal. The traveling EAA Aluminum Overcast road show is no different. The crew didn't know any of us in Eugene, we were just a line on their schedule until this morning. But when they learned we had a giant Duck that wanted to fly, the crew from EAA made it happen. Because that's what pilots do, we help each other. Stay tuned over the weekend when I publish part two of this report telling my Airplanista readers what it was like to fly in such a legendary airplane rich in aviation history. The sights, the sounds, the spirits that live within this special airplane, it all came alive the moment those four gigantic radial engines cranked up to lift "The Fortress" skyward once again. To receive notifications of this next blog post and all fresh Airplanista content, add your email to the "Subscribe" field at top right and use the SHARE buttons below to pass this story along to your friends, fans, family and followers. Disney's Planes: Can One Movie Really Save GA?